Draw Mania (previously known as Charadium II) is the newest incarnation of the fun, well-produced Charadium iPhone app by On5 Games. The Charadium II app remains an addictive, superbly functional pictionary meets charades iPhone game. Charadium II starts with a handy, well-produced tutorial to get you started quickly. When I drew my first picture, my jaw dropped. It is an incredibly responsive interface. Great artists and those with agile fingers have incredible tools at hand to draw fantastic images. The rest of us get to see every flaw we make. You can sign in to Charadium II via your Facebook account, email credentials, or as an anonymous player. The home screen is filled with content. It’s busy and cluttered. The font is incredibly small on an iPhone screen and hard to read. The iPad version of Charadium II would certainly create a more harmonious home menu simply by having a larger screen. Charadium II has three different games and functions from which to choose. You can play Classic Charadium which is a game of 15 rounds of people drawing images in turns. You can play Ping Pong where people play in turns, but there are no time limits. Or, you can draw for fun. And, for serious Charadium II gamers, you’ll want to spend some time exploring the tools and effects to create great pictures in the draw for fun interface. You can play with your Facebook and Game Center Friends, as well as friends in your contact list. You enter rooms where you play against other Charadium II addicts. You are placed in rooms based on your current level of ability and accrued points. I was completely annihilated in the newbie room, but it was a fun beating. You have just a couple of seconds to choose the word you wish to draw. Quickly, you have a white screen with the history of the game lightly highlighted on the left side of the blank space to keep tally. At the bottom of the screen, you have all of your artistic tools at your disposal. There are lots of great colors and several different tools to apply the colors. You could use a brush for a wider stroke, a pencil for a thin line, and a feathered brush for light, airy full texture. The erase tools are also excellent and respond nicely. You earn points for drawing, as well as correct guesses with an onscreen keyboard. You gradually collect medals and esteem as you progress and become a better player. Charadium II has a moderator to keep out and deter inappropriate behavior. This is a great, comforting feature for parents, as the game is certainly appealing to kids. Within the app, you can also purchase gifts to share with your Charadium II friends. You are also encouraged to share your results on your Facebook Timeline too. 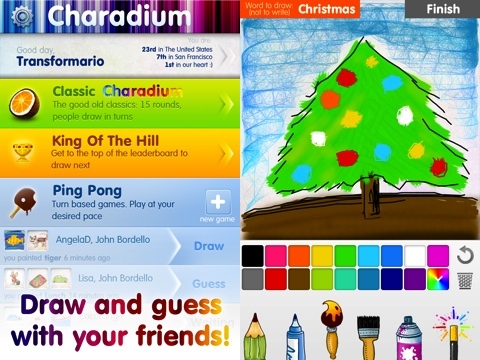 Charadium II is definitely more responsive and more sophisticated graphically than OMGPop’s Draw Something. Charadium II makes a great game even more exceptional. 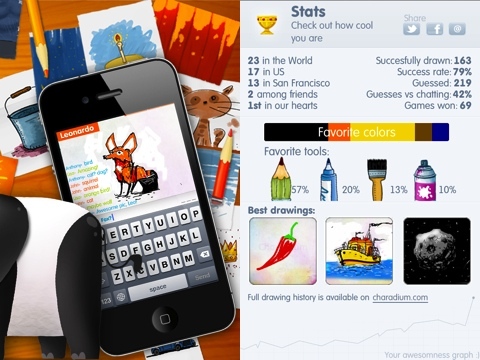 AppSafari review of Draw Mania (previously named Charadium II) was written by Jenni Ward on March 13th, 2012 and categorized under App Store, Featured, Fun, Games, Multiplayer. Page viewed 6101 times, 2 so far today. Need help on using these apps? Please read the Help Page. I can’t seem to figure out how to accept people that have added me as a friend..